The Cross-Government Design Community exists to build the practice of design in government and to help designers work together and support each other. The community has grown significantly in size over the past few years. There are currently 1,176 people signed up to receive community updates through the Digital Service Designers mailing list. There are lots of ways to contribute to and take part in the community. For example, by suggesting components for the GOV.UK Design System, talking at cross-government community events or helping to run training across the country. Lack of time to contribute – as community work is not generally part of people’s annual objectives and set goals. Lack of clarity about ways to get involved and actively contribute to the community. Participating in a community is not something people should do only when they have the time. It is an integral part of being a designer in government – to share ideas, work together, build our capability and work efficiently. So we want to make it as easy as possible for people to get involved. To do this, we held a session with the Heads of Design from departments across government to agree cross-government design community objectives. These are objectives that people across government can add to their annual performance objectives, to show how contributing to the community is an integral part of their role. The community runs lots of cross-government meetups and we’re always looking for people to get involved and contribute new ideas. There are also events happening all over the UK throughout the year to share with the wider public and build the reputation of design careers in government, like Manchester Design Week, Birmingham Design Week, and London Design Festival. If you have an idea for a theme or are interested in hosting or facilitating a community event, please email the User Centred Design (UCD) Community. Design crits are a valuable tool to include in your practice. Crits are for sharing work in progress at any stage of development to get feedback and advice. The user-centred design (UCD) team at GDS runs cross-government design crits in London. You can attend to see how they are run and participate. You can sign up for the next design crit day on 12 April 2019. For future crit days check the UCD events and training page. You can also run crits with your teams and set up cross-government crit days outside London. The Design in Government blog is open for contributions from designers across government. The blog is for designers across government to share their projects, ideas and concepts. If you have an idea for a blog post, please email the UCD Community. Every month the International Design in Government community has a call on a theme. We invite people from the UK and governments around the world to share their work with the community. It is an opportunity to share the work of the UK government with international colleagues, find opportunities for collaboration, and talk with others working on similar challenges. To take part, join the community and respond to the monthly call for contributors. 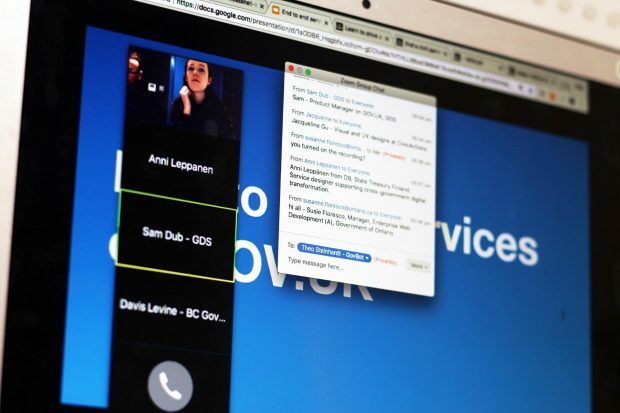 From May 2019, the cross-government community will be running Service Thursdays – a monthly remote YouTube Live show and tell with a case study from a government organisation. We’re looking for case studies where user-centred design has made an impact on service transformation. For example, during Services Week we heard from the Blue Badge team at the Department for Transport, Tax-Free Child Care at HM Revenue and Customs, and Check Your State Pension at Department for Work and Pensions. If you’d like to present your work, email the UCD Community. The user-centred design team at GDS currently runs 2 design training programmes: Design induction training and Introduction to service design training. The team is small and needs help from the community to scale the training outside of London. To get involved, please email the UCD Community. The Digital Service Standard is a set of 18 criteria to help government create and run good digital services. Every digital service must sit a series of service assessments to ensure they meet the standard. Together with product managers and technologists, user researchers and designers sit on an assessors panel in every assessment. To become an assessor in your department, contact your organisation’s assurance team. To become a cross-government assessor for GDS assessments, email dbd-assessments@digital.cabinet-office.gov.uk and your organisation’s head of design. Service Communities are networks of people from across the public sector who work together to design and deliver an end-to-end service. You can set up or join a service community to learn what other teams are doing on the wider user journey your service is a part of, develop a common understanding of your users and their needs and address common collaboration challenges. To find out more, get in touch with the service communities team at GDS. 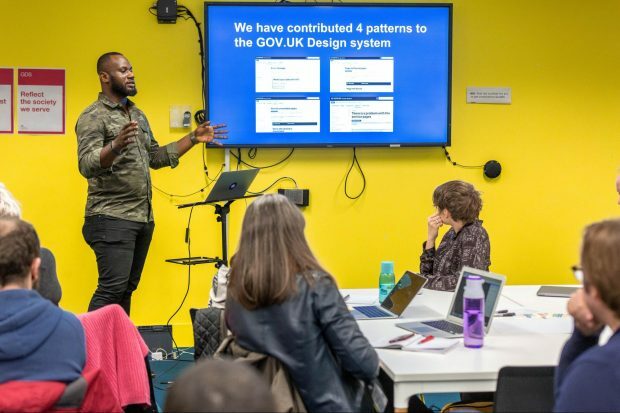 The GOV.UK Design System contains styles, components and patterns to help teams across government design and build services. People from across government can contribute to the Design System. There is an open process for contribution, including the community backlog on Github, guidance on proposing or developing a new pattern or component and the Design System working group. You can read more about making contributions. If you are part of the design community or line-manage someone in the community and want to find out more about these objectives, get in touch with Kara Kane, community manager for user-centred design.